Sheep: Fat lambs sell to £102.20 and fat ewes to £95. A smaller show of 850 head was presented at Swatragh Livestock Mart on Saturday which was met with a very strong trade for all types of stock. A small entry of ewes saw good demand for well fleshed ewes, topping at £95. Sample prices: Heavyweight lambs - Ballymena producer; 32kg at £102.20 = 3.19p; Claudy producer; 30.5kg at £102 = 3.34p; Desertmartin producer; 32kg at £101.50 = 3.17p; Limavady producer; 32.5kg at £101.50 = 3.12p; Coleraine producer; 30kg at £100.20 = 3.34p; Ballymoney producer; 26.6kg at £100 = 3.76p; Maghera producer; 26.7kg at £100 = 3.75p; Castlerock producer; 29kg at £100.80 = 3.48p; Rasharkin producer; 27.3kg at £99.50 = 3.65p; Dungiven producer; 26.6kg at £99.20 = 3.73p; Maghera producer; 26.5kg at £99.50 = 3.75p and Bellaghy producer; 26.2kg at £98.50 = 3.76p. Mid-weight lambs: Magherafelt producer; 24.5kg at £99.50 = 4.06p; Cookstown producer; 24.5kg at £98.80 = 4.03p; Maghera producer; 23.5kg at £96.00 = 4.09p; Upperlands producer; 24.4kg at £97.00 = 3.98p; Ballymoney producer; 24.5kg at £97.50 = 3.98p; Ringsend producer; 23.8kg at £97.20 = 4.08p; Swatragh producer; 22.8kg at £95.80 = 4.20p; Limavady producer; 22.9kg at £89.20 = 4.05p; Castlerock producer; 22.3kg at £89.00 = 3.99p and Ahoghill producer; 21.4kg at £90.00 = 4.21p. Lightweight lambs: Upperlands producer; 20.8kg at £87.20 = 4.19; Maghera producer; 20kg at £87.00 = 4.35p; Draperstown producer; 19.7kg at £84.50 = 4.29p; Ballymoney producer; 19kg at £83.00 = 4.37p and Dungiven producer; 18.3kg at £81.80 = 4.46p. Sample fat ewe prices: Ardmore producer; 1 ewe at £95.00; Swatragh producer; 1 ewe at £89.00 and Rasharkin producer; 4 ewes at £88.00. 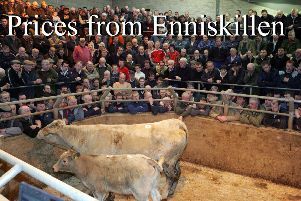 A good entry of good quality cattle on Monday which was met with a strong trade for the cattle on offer. Bullocks sold to a top price of £1,110 for a Charolais weighing 538kg. Heifers sold to a top price of £1,095 Charolais weighing 552kg. Heifers: Swatragh producer; Limousin, 400kg at £1,030 = 2.58p; Limousin, 448kg at £1,055 = 2.35p; Limousin, 346kg at £785 = 2.27p; Limousin, 348kg at £700 = 2.01p; Limousin, 390kg at £800 = 2.05p; Limousin, 344kg at £750 = 2.18p and Swatragh producer; Charolais, 514kg at £1,085 = 2.11p; Charolais, 516kg at £1,035 = 2.01p; Charolais, 552kg at £1,095 = 1.98p and Swatragh producer; Charolais, 454kg at £990 = 2.18p. Bullocks: Charolais, 440kg at £980 = 2.23p; Charolais, 480kg at £960 = 2.00p; Charolais, 454kg at £870 = 1.92p; Limousin, 570kg at £1,070 = 1.88p; Limousin, 504kg at £1,045 = 2.07p; Limousin, 516kg at £990 = 1.92p; Limousin, 540kg at £1000 = 1.85p; Swatragh producer; Limousin, 298kg at £650 = 2.18p; Limousin, 318kg at £785 = 2.47p; Swatragh producer; Charolais, 538kg at £1,110 = 2.06p and Ballykelly producer; Aberdeen Angus, 380kg at £835 = 2.20p; Aberdeen Angus, 362kg at £825 = 2.28p; Aberdeen Angus, 420kg at £865 = 2.06p. Jan 2019 sponsor: NCCE Farmware Store.